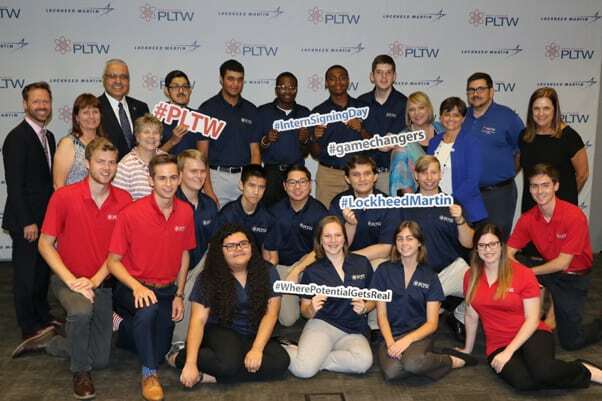 Back to top ↑ Arlington ISD > Lockheed Martin Intern Signing Day a Success! Lockheed Martin Intern Signing Day a Success! When Austin Smith started his Lockheed Martin internship his senior year in 2014 at Martin High School, the hope was that it would lead to a full-time job. The dream came to fruition Monday as Smith and three other former AISD students from the inaugural Lockheed Martin internship program each received job offers at the company’s High School Intern Signing Day. Smith, Amy Hughes, Benson Phillips and Abdallah Shishani each plan to accept the offers that were officially extended Monday. Their offers culminated a day in which 18 AISD students were part of the 47 new interns who signed up for the program along with students from Fort Worth, Crowley and Keller. View pictures from the Lockheeed Martin Intern Signing Day here. The internship program began with five AISD students from the Project Lead the Way program in 2014-2015, and the foursome will start their jobs after they graduate from college next May. Lockheed Martin’s goal with the program is that every successful high school intern continues as a college intern and joins Lockheed Martin upon graduation. That’s exactly what the four who received offers did. They started their internships their senior year, spending that year working at Lockheed Martin in addition to their regular classes and following that with internships in college. Now the former AISD students can enjoy their senior year of college without worrying what awaits them after graduation. Hughes, a computer engineering major at Texas A&M and an Arlington High graduate, fell in love with the Lockheed Martin environment during her senior year internship. For Phillips, who is a mechanical engineering major at UTA and went to Arlington, the transition to full-time employee will be an easy one. In addition to his internship, he’s been a contractor at Lockheed Martin throughout college. But knowing that Monday was a culmination of a program that started for these four when they were in eighth grade is special.